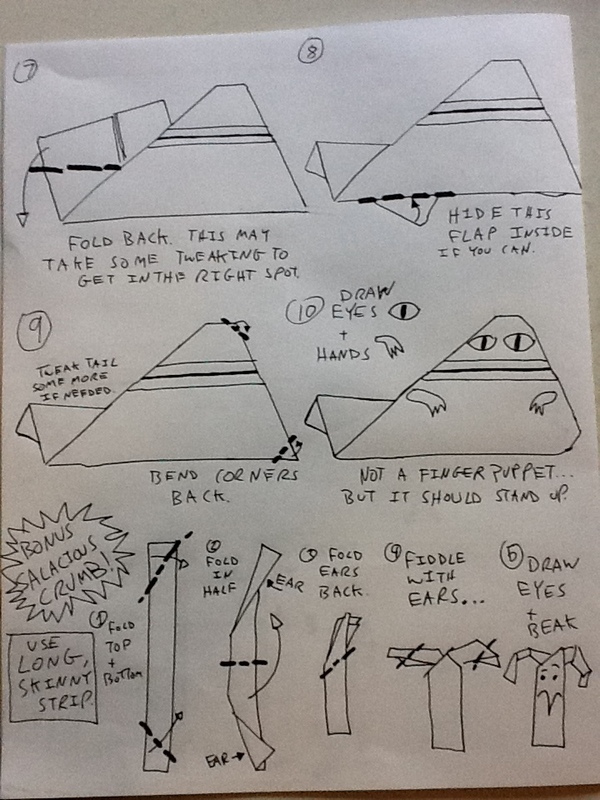 For May the Fourth… EZ Origami Jabba Instructions +more! Happy Star Wars Day, SuperFolders! May the Fourth be with you! 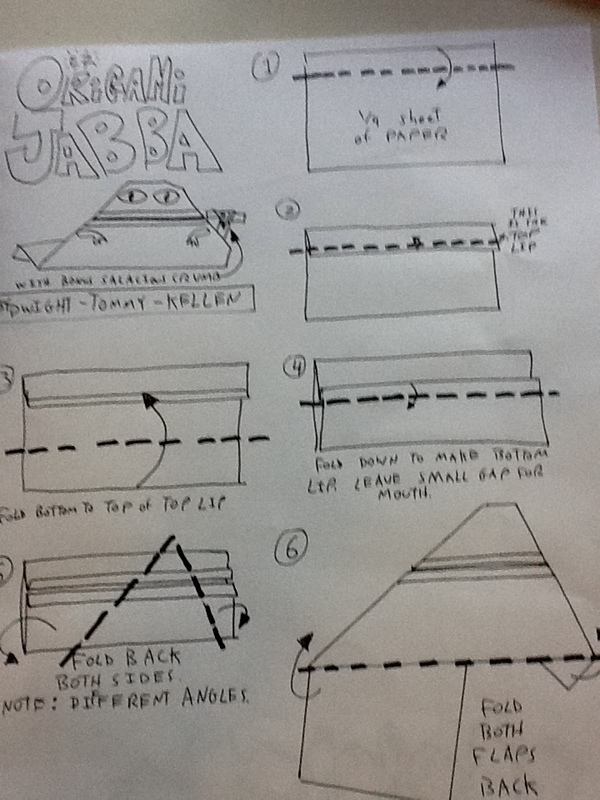 To celebrate, here are instructions for making Origami Jabba with a bonus Salacious Crumb! And… Congratulations to our contest winner(s) Bridget and Jimmy who guessed that Origami Jabba would be the star today. (Yes, we have two winners. Long story. But they both deserve it!) Bridget and Jimmy, have your parents email me an address where I can mail your prize. Okay, ready for a little Darth Paper Strikes Back secret? I hoped to show you the cover today, but it has received final approval yet. So I’ll mention something it says on the back cover…. I just made one. It looks kind of like a frog for me, but it also looks like Jabba. Sort of. What is so big on StarWars.com? Wow, that’s so stooky for them. Massively bolt! Totally sticky stuff! Plastic dinosaurs! Enough with the Murky talk though. Those lucky people! The game is probably like, O.y. Vs. D.p. the game is those ships that they were playing in computer class! TOM YOU ARE SO EPIC!!!! PLASTIC DINOSAURS!!!! BTW i made Jabba and Scandilious Crumb! tom please reply to this. can I play as Harvey in the strange case of origami yoda in the movie? my popa is making a hard origami yoda. Gee, I was hoping to play Harvey in the movie! No movie news, just in case you were wondering…. That’s going to take a bunch of people in Hollywood to get excited about the book. Well, it won’t take long for those people to find how awesome your books are! LOL. . . Reading this now after two years… Now I’M Harvey in Origami Yoda: The Series. Time passes fast when you’re a SuperFolder! That would be a big mistake to say they were Justin Bieber instructions! Hey Tom, will you have a new website like you did for Horton Halfpot.com or will you post all of the Darth Paper stuf here? holly mackerel joeyyodafan!!!! whats up with that!! sorry. anyway I wonder if the game is a video game. I tried to fold it. Couldn’t. Too hard. So I invented my own Origami Jabba! It’s really simple. I don’t think I could make instructions, Though. Good! Inventing your own is always good! Loved seeing you at Hickelbee’s in San Jose. New fad at school is origami! Cool to be a trend setter. Thanks for coming to Hicklebee’s! i wish i can make the cover one. I finally made the cover yoda!!!!!!! i made alot of origami stuff so did my sis. i made a origami person from youtube. they did not have legs so i made legs. i made a origami person on youtube. it had no legs so I added legs. tom how did you make a origami of you? i saw it in a youtube video. Do you start with the colored side or the white side? It should be green on both sides. I’m getting more and more popular every day for handing out oragami. keep posting instrutions! P.S. Did i spell instructrions right? Is there going to be an origami yoda movie? im making a play. obviously, im dwight. purple. Dude I actually lie around in weird places in the library, fold yodas even though a guy said it annoys him and I give out advice with yoda. me 4… all the time. This is the best thing ever!!!!!!!!!!!!!!!!!!!! Thank you so much Tom! Can I email you to talk origami,man? I read all 3 books in one day! I also made Origami Yoda, Darth Paper, the Fortune Wookiee, Han Foldo, Luke Skypaper, and Origami Jabba! I LOVE YOUR BOOKS!!! I can’t wait for the fourth book!! My friend Andreas thinks that jabba has hair. Will there be a movie? And if will there be as many movies as books? It looks great but it doesn’t stand up, yet it works asafinger puppet. Weird. Oh yeah, I made an origami obi wan!!! And it can basically be used as any Jedi or sith because the face is drawn on. Hmmm.origami instructions for R2D2 and Jabba now i need C3P0 to (sort of) complete my collection! I’ve got the moves like Jabba. When i made Jabba, I found out the open mouth went all around him. Was that suppose to happen? Tom Angleberger what about those jedi aliens or squid people how do you make those?they are somtimes reconized. Monsterly bolt Jabba and Crum! Is it possible to get other printed paper? Like, do you have paper for Origami Yoda or Darth Paper or something? Also, will there be folds for other characters in starwars in the Art2-D2 book? Like, General Grevious or a clone trooper or a Darth Maul? Also, will there be a cover Art2-D2? like there was simple yoda, intermediate yoda, and a cover yoda(complex). Same thing for Darth Paper too. your on your way man! I did the Front cover yoda! oh i saw you make the storm trooper helmet hard……. I have invented 20 origami star wars characters!!! Ooh I cant wait for my post to be put on the website!! Made the little guy. Couldn’t make Jaba. This is the cover star for the fourth book now too. The Surprise Attack of Jabba the Puppett! 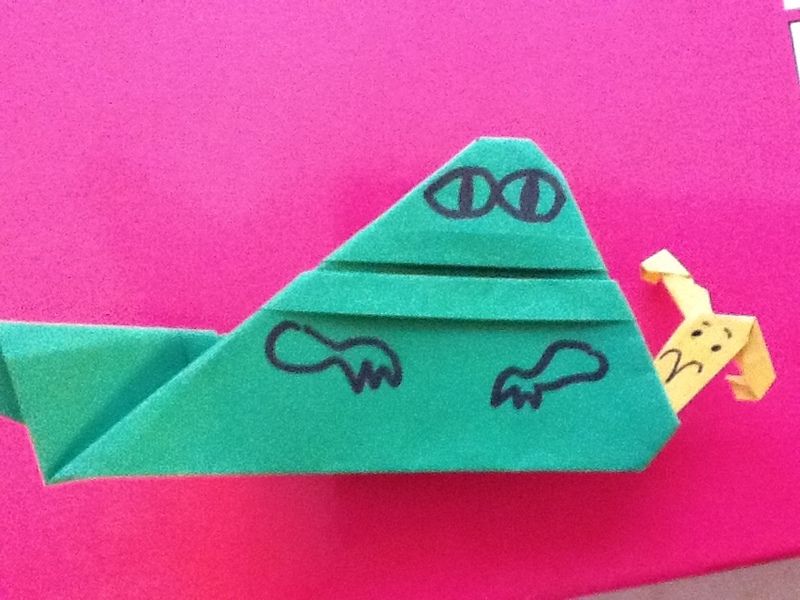 I made my own Jabba origami design once. I had to tape the front, but, it made a Jabba finger puppet! i invented a origami luke skywalker, by the way. Anyone notice how may the fourth sounds like may the FORCE? make a book about jawas!!!!!!!!!!!!!!!!!!!!!!!!!!!!!!!!!!!!!!!!!!!!!!!!! Ugh,why is everyone obsessed with Jawas these days? how do you make the cover jabba? The Game Is Paper Star Wars You know the one where you flick pencils!!! I played it a few times. me and my friends are almost experts we added portals and Jango Fett with clones! i made one,but he has no tail lol! plus i made mine a finger puppet that’s why he has no tail. I totally found out how to make Salicious Crumb’s ears, Stooky! I know how to make the cover art2! how do u fold a jabba the puppett like the one on the cover of the surprise attack of jabba the puppett? I made the Jabba from the cover but there is a space to put your finger in(it’s under the mouth). how do you. i whanted to find out so much i had a dream with it and i found out my own way to fold it. with a few tweaks to the tail, you can make the real jabba!! im horrible with pleats, so it was kind of hard for me. Me to i just tape a strip of paper on the back. Admiral Ackbar, How do you do it? shut up! did you really? wow these instructions are great! P.S i can use it as a finger puppet. HEY WORLD, (AND YODAS), I HAVE A NEW PRODUCT CALLED YODA FOOD,THANKS TO SCOTT CLAUSON, WEREVER YOU ARE…..